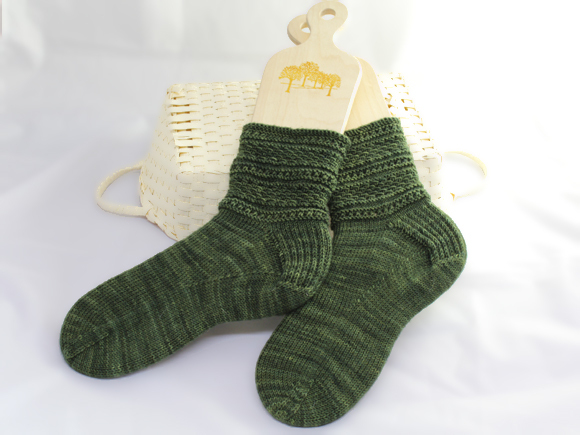 This is my third pair of socks from the Silk Road Socks book – and these are named Afshari. I cast them on for the April/May round of the KAL and knitted them in Colinette’s Jitterbug sock yarn. The Afshars (sometimes spelled Avshar) are a nomadic Turkic tribe who originated in Central Asia and are now found in parts of Iran, Syria, and Turkey. Many Afshari make their home in the area surrounding the Iranian city of Kerman. Most of the rugs woven by the villagers and nomads from this area are called Afshari (even though some are made by people from other groups such as the Buchakchi). Afshari rugs are quite diverse. They use a number of construction methods and feature an array of different designs. Despite this variability, certain similarities exist. Most Afshari carpets are predominantly red or blue, and many (especially the flatweaves) feature repeated horizontal bands of intricate motifs. 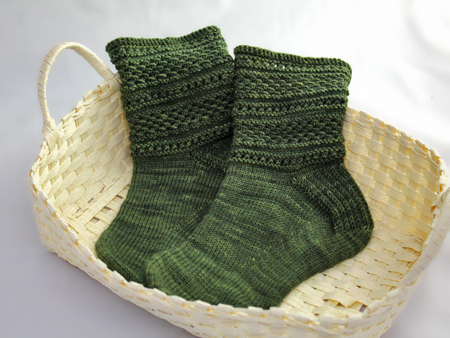 The cuffs of these socks draw from this tradition and showcase a variety of elaborate textured stitches. A real pleasure to knit! Afshari is knitted top-down, beginning with three plain rows – no rib. The leg alternates two simple charts of 11 and 13 rows. 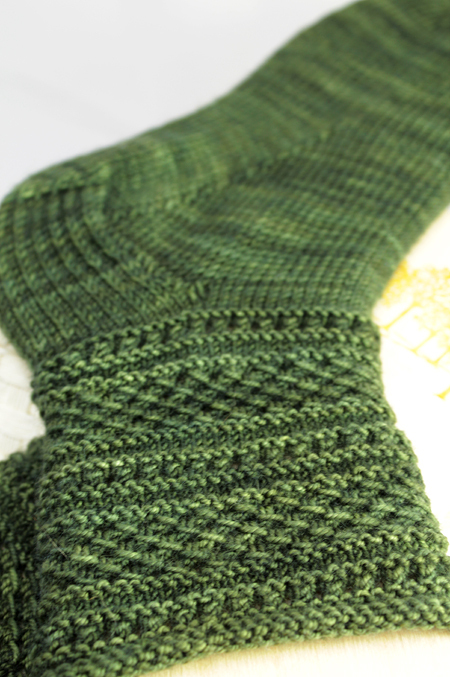 The foot is stocking stitch but has an unusual gusset shaping, to maintain interest. The result is a handsome sock, easy fitting …Â and easy to wear. The semi-solid nature of the Velvet Leaf Jitterbug suits this pattern ideally, though there are some variegated yarn examples that look equally fine in this pattern and it clearly is suited to some more extrovert yarns than the one that I chose. Perhaps if I had deployed something more outrageous, I would not have lost these socks to Mr L, who – when asked if these socks were too fancy for a bloke, replied to the contrary and claimed them for his use. 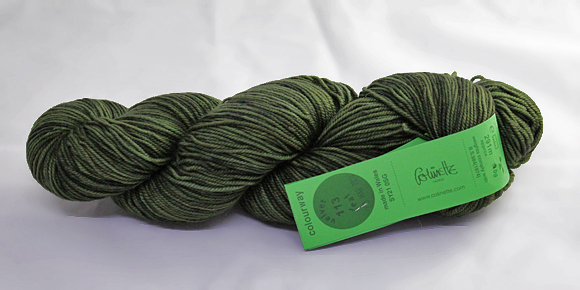 So – Afshari is a Bloke Sock Appropriate Pattern (BSAP) and a Fast Knit too. Worth having in the repertoire. 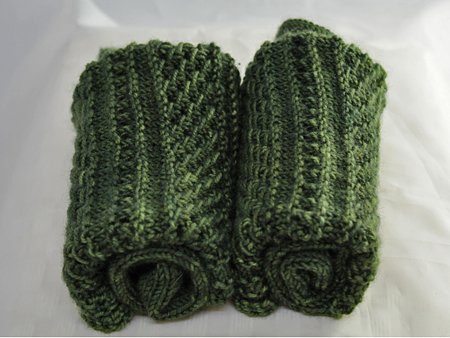 I chose Jitterbug for these socks as the gauge given in the pattern is 7 stitches per inch and it is a 60 stitch sock. I normally knit more like 8.5 or 9 SPI on a 64 (for me) 68, or 72 ( for him) sock and use a 2.5mm needle. For the Afshari, I chose a 2.75mm needle, which yielded a pleasing fabric but a rather large sock – so I should probably not begrudge its migration into the other half of the wardrobe.